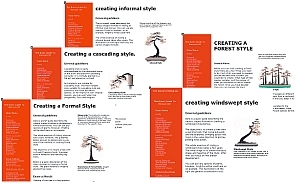 Whether you are a casual bonsai hobbyist or a beginner with little or no knowledge about bonsai, the ALL NEW bonsai cd with easy and simple instructions will show you the finer points in creating beautiful bonsai. 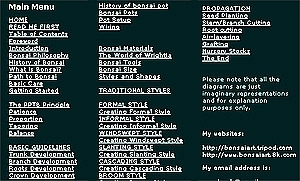 The Basic Guide to Traditional Bonsai CD1 is specially created for anyone who is interested to learn the art of bonsai. The guidelines are simple and easy to follow with step by step guide accompanied with illustrations. Bonsai is an art. There is no short cut to it. If you wish to create beautiful bonsai then you need to know the basic guidelines, principles and concept about bonsai. Learn the philosophy behind it and you will learn to enjoy it. This is what this cd is all about. Bonsai is an art. There is no short cut to it. The BTPP Principles - patience, proportion, tapering and balance. These are the main four principles which form the basic foundation in creating a beautiful bonsai. A comprehensive guide in creating 8 traditional styles from seed planting to a finished bonsai. A step by step guide on creating 8 traditional bonsai styles. Registered First Class Postage : US$4.00.